Vape Superstore is a UK retailer and, IMHO, one of the best in operation right now in good ‘ol Blighty. They have a range of products, from mods to tanks, and an extensive amount of E Juice. Today, we’re going to be talking about Vape Superstore’s own line of E Juice which is called 50/50 and 70/30. Odd names, yes, but they’re actually telling you the VG/PG split, and this is handy to know when buying new E Juice. The 50/50 range is more geared towards MTL (mouth to lung) vaping, so the kind of vaping you do with pen vapes, pod mods, and MTL tanks like the JUUL and Kayfun Prime. The 70/30 range is higher in VG, meaning its less throaty, and is, therefore, better suited to sub-ohm (DTL) vaping. It’s smoother and better suited for use in high-performance tanks like RDAs and RTAs, as well as high wattage sub-ohm tanks. As I said, the 50/50 E Juice Range is rather throaty, meaning there is a definite throat hit on the inhale. This means it’s not really suitable for use inside an RDA or an RTA – or any rebuildable for that matter (unless it’s MTL). For smaller, less potent MTL vapes, however, it is ideal. If you’re rocking a vape pen it will work great. I did try some of the 50/50 range with my Dead Rabbit RDA, but the PG was too overpowering. Inside my Kayfun Prime, however, which is MTL RTA, it was great. And the reason is the way you inhale; MTL vaping is always better with E Juices that contain higher amounts of PG, simply because PG hits your throat too hard on DTL tanks; this is why RDA users prefer high VG E Juice. The 50/50 E Juice Range is well packaged, and I like the simple bottle design. It’s nothing too fancy, but it looks sharp as a tack, and all the pertinent information is readily available on the box and bottle. 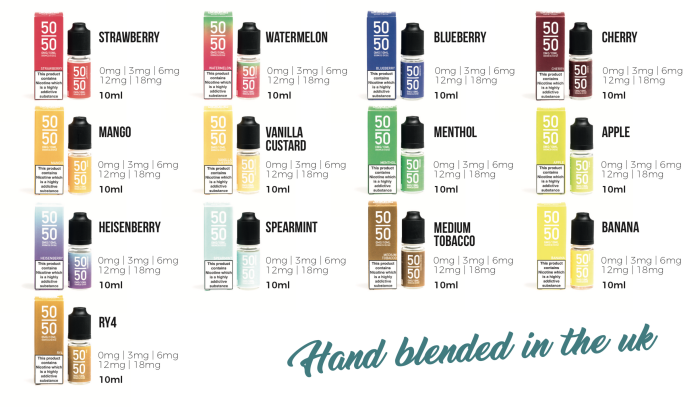 All told, there are 13 flavours in the Vape Superstore 50/50 E Juice Range and I have been through each and every one of them. But this is where it gets tricky, as what I like, you may not – we’re all different and we all like different things. And this ALWAYS makes reviewing E Juice really tricky. But, please, do not let that put you off. The reason I didn’t like these is that I don’t like E Juice in those flavours – ever! It’s just not my bag. You might be different, so if you like minty vapes or tobacco flavoured vapes, do check them out. This is more my cup of tea. I vape using RDAs and RTAs most of the time, and when I’m not using them, I’m rocking a high-wattage sub-ohm tank. For this reason, I want my VG count as high as possible. Normally, I’m an 80/20 kinda guy, but 70/30 is close enough. It’s not quite as smooth to my tastes, but it’s 95% there, and that’s good enough for me. If you’re rocking a high-power sub-ohm tank or an RDA, these are the ones you want to be looking at. The flavour profiles on each are very well executed. I tried the Vape Superstore 70/30 E Juice Range on a variety of RDAs, RTAs and sub-ohm tanks and they tasted superb on each and every one of them. And this was unexpected, as this line of E Juice is priced very aggressively. I didn’t care for Caramel Coffee Custard, but I despise coffee E Juice, so this is completely understandable. The others were very good though. I could literally vape the Lemon Raspberry Cupcake, Sweet Apple Pie, Sweet Honeydew Fruit, and Apricot Strawberry Mango flavours all day long. They were awesome! Overall, this is a very solid line-up. 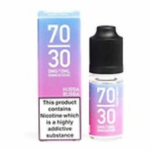 Way better than I was expecting, so if you’re in the market for decent quality, high VG E Juice that doesn’t break the bank, make sure you take a look at Vape Superstore’s 70/30 Range. For the price and flavour selection, you could definitely do a lot worse! 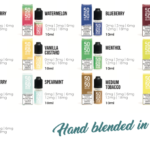 If you’re after something fresh and fruity, you could do a lot worse than Vape SuperStore’s Fresh N’ Fruity Range of E Liquids, which I recently had the pleasure of testing. 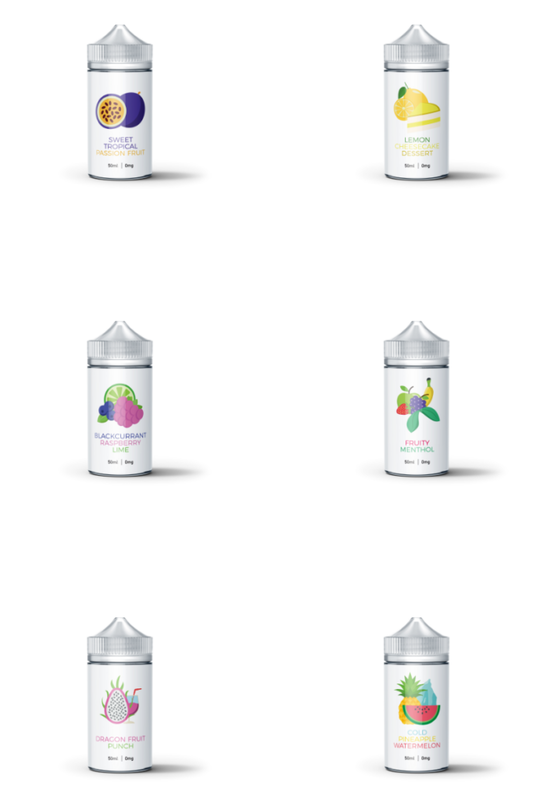 The range (well, what they sent me) featured six flavors, all of which have an emphasis on fruits and freshness, save for the Cheese Cake one. It’s really to say anything truly definitive about an E-Liquid, as tastes are inherently subjective. I happen to like fruity and fresh E Juices, so I was pleasantly surprised by what awaited me when I unboxed the package. These are high VG juices, so they’re ideal for high-power vaping inside sub-ohm tanks and rebuildable setups like an RDA or RTA. The quality of the juices in this range is superb. The flavor, the notes, everything is as it should be. My only real concern with any of them was that the Lemon Cheese Cake Dessert didn’t really taste like Lemon Cheese Cake. It still tasted great but didn’t really have any sort of pastry notes that I could detect, which was a little disappointing. My two picks for the range were: Blackcurrant Raspberry Lime and Dragon Fruit. Why? They tasted great in every tank I ran them though. Proper all-day vapes, these ones. 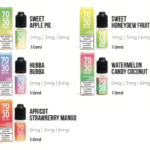 The bottom-line here is simple, though: if you’re looking for quality, low-price UK E Juice that is high in VG and tastes great, you should 100% check out Vape SuperStore Fresh N’ Fruity Range. Prices start at £11.95 for 50ml – so not too bad at all!